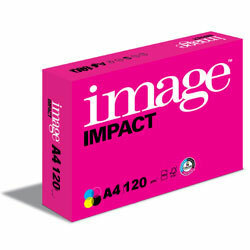 Image Impact is a high quality copier and laser paper with a bulky feel for high quality document production. Use Image Impact where you need the highest quality document paper and want the assurance of consistent guaranteed performance. Particularly suited to prestigious external communications. Image Impact has high whiteness to show off image colours and high opacity for double sided printing. Guaranteed for use on both colour and mono laser and inkjet printers, copiers (including high volume) and fax machines. Image Impact incorporates ColorLok technology for improved results on inkjet. Produced using FSC accredited pulp from well-managed forests independently certified according to the rules of the Forest Stewardship Council. Wood fibre from well managed forests. ECF Low Chlorine. ISO 14001. FSC mixed sources.